Michael Zelenko's "The Birth of Phone Hacking"
Michael Zelenko has just written a very nice article about the history of phone phreaking for BULLETT magazine. 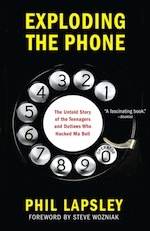 Titled "The Birth of Phone Hacking and How It Set the Stage for the News Corp. Scandal," it lays out the start of the hobby in the 1950s and 60s and traces it up the present day, including some nice quotations from Mark Bernay and Ron Rosenbaum along the way. Worth checking out! We're still nailing down the details of a reading in New York City, likely in early March. The latest updates and additional details about each reading, including address, map, and start time, can be found on the Exploding The Phone Book Tour page.